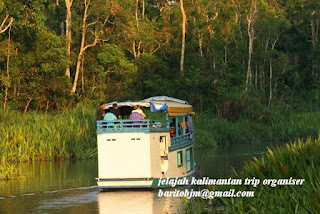 We are Jelajah Kalimantan Travel Services, we can arrange your trip to Borneo Island in Indonesia for Tanjung Puting National Park, Derawan Islands, Bamboo Rafting & Floating Market at South Borneo etc. Tanjung Puting National Park Tour Package is one of our services. The hidden paradise in Central Kalimantan/Borneo, Indonesia. - Tanjung Puting National Park, Central Kalimantan (3D2N). 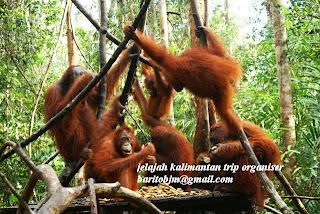 The destination where you can find a great jungle of Borneo/Kalimantan. To visit this place, we can bring you to the jungle with a boat (live on board trip). There are so many things to see. Like a jungle, river, and so a lot orang utans there..! 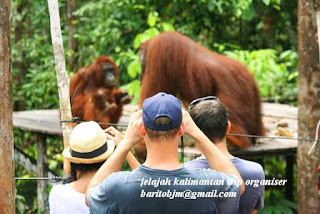 You can meet and see orang utans in their jungle. Our package for foreigner tourist is starting from IDR. 4.500.000/2 persons/private trip. The price are included boat live on board, meals & drink, car from airport to the port, local guide, and pass fee to the national park. The price are excluded flight from Jakarta and others city to Pangkalan Bun, Central Kalimantan return. Tagged : Tanjung Puting National Park, Orang Utan Trip, Borneo Trip, Tanjung Puting National Park Tour Package, Trip to Borneo, Trip To Tanjung Puting National Park, See and Meet Orang Utan Trip, Adventure to Borneo, Orang Utan Indonesia, Orang Utan Borneo . Mantap, sekarang jadi tour guide apa udah bisnis tour guide mas ? I can review your trip on my blog, dude.. keep it up. ada asuransinya ga tour di kalimantan?? safety guarantee? ?